Not all customers (buyers) are equal and the cost of selling to an early adopter is one or two orders of magnitude higher than selling to a mainstream buyer. Thought-leadership on the importance of aligning your selling process, marketing and value-chain with the way your customers buy. 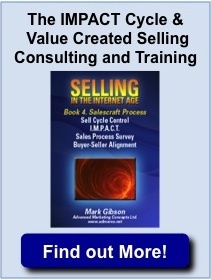 Learn how to engage decision makers and overcome typical problems encountered in selling to early adopters so you can get your "killer products" sold. For an audience involved in B2B product development, marketing, sales and business development. Will be of particular benefit to Angel and Venture-investors, entrepreneurs, leaders of early stage companies, marketing and business development professionals.